The OS-MINI has miniature sensing head to fit most applications and configurable electronics package. They use short wavelength measurement for low-emissivity targets such as steel rollers and other metal surfaces. Field of views from 15:1 to 75:1 plus a close focus model are designed to fill most industrial requirements. 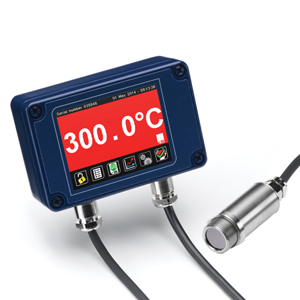 The optional backlit touch screen interface mounted in the electronics module, provides an easy-to-read large, bright display of the measured Temperature, as well as controls allowing full configuration of the sensor. The graph view allows viewing the history of the measured temperature. In alarm condition, the display turns bright red to provide an immediate and obvious alarm indication. The alarm levels and modes can be configured from the touch screen. Note: Comes with OS-MINI22, sensing head and 1 m (3') cable, electronics module and operators manual. To Order Extra cable add suffix -CEx where x = total lenght in meters. Example -CE6 = 6 meters if cable. Price adder is for 5 extra meters.